Today marks AMD's release of the next energy efficient 65W TDP processor. It is a socket AM3 processor called the Phenom II X4 910e. It features a 2.6GHz clock frequency, 200MHz bus with a 2000MHz HT link and memory support for both DDR2 (up to 1,066 MT/s) and DDR3 (up to 1,333 MT/s). With specifications like this, this processor is ideal for a Home Theater Personal Computer (HTPC) and any other application where noise, heat, and power consumption are a concern. 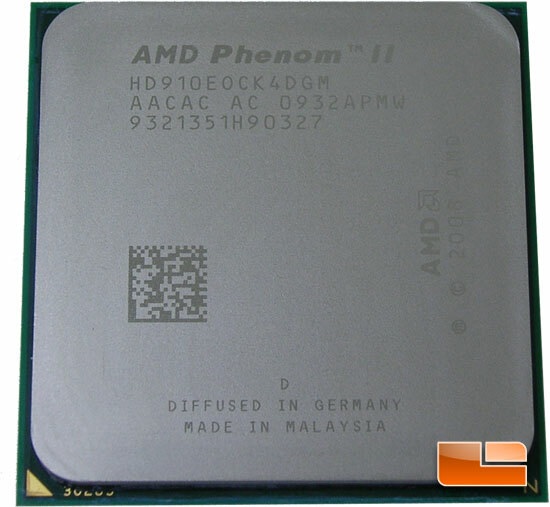 The AMD Phenom II 910e is a Quad-core processor that features the Deneb core. The predecessor to the Phenom II 910e was the 905e. The Phenom II 905e had the same bus speed as the Phenom II 910e has but the multiplier was x12.5 while the Phenom II 910e has an x13 multiplier. That small bump in the multiplier is what accounts for the 100MHz difference in the two processors. That means that the AMD Phenom II X4 910e has a final clock frequency of 2.6GHz with 2MB of L2 and 6MB of L3 cache. Not bad specifications for a processor that has a TDP that is nearly half the Wattage used on other popular Phenom II X4 processors! The AMD Phenom II and Athlon II product stack is strong as usual with prices starting out at just $60 for the AMD Athlon II X2 240 and rising up to $195 for the Phenom II X4 965 BE. 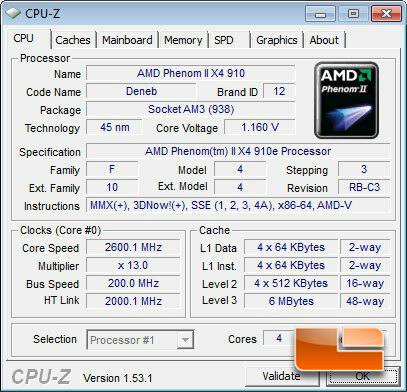 The AMD Phenom II X4 910e comes at $169, which means that it carries a price premium since it is an energy efficient part. Based off current pricing, it would appear that the AMD Phenom II X4 910e costs roughly the same as a standard efficiency processor that has a slightly higher clock frequency. That means you'll be paying more and getting less processing power, but on the flip side you'll get a lower electric bill and lower temperatures. If you want to build a silent system of an HTPC, this decrease in clock frequency and the extra price is more than worth it in order to have a silent computer.